While the concept of crowdsourcing is not exactly new, the public knowledge of this movement s picking up notable speed among many all over the world.Crowdsourcing, not to be confused with crowdfunding (crowdfunding being the act of many people contributing funds to support an idea or project that needs funding to become a reality), is an art movement that is gaining public attention in big ways. Crowdsourcing art is when an artist or group of artists enlist the help of others to work with them in completion of a piece of art or project. The beauty behind crowdsourcing is the truly unique quality that is generated by the variety of people working together on one project. Its uniqueness comes from the final artworks irreplicable components that were brought to life by the unpredictable nature of different audiences with different artistic abilities. These artist-orchestrated projects can be seen all over the world in museums, galleries, public spaces, and online. Recently, crowdsourcing art was commissioned for the popular TED conference to celebrate it’s 30th anniversary. TED is an extraordinary nonprofit devoted to sharing ideas worth spreading and the crowdsourced art was a perfect fit for this celebration. It can be said that the crowdsourced-art movement reflects a very basic and essential human need in people to connect with others and to do so in tangible, meaningful way. 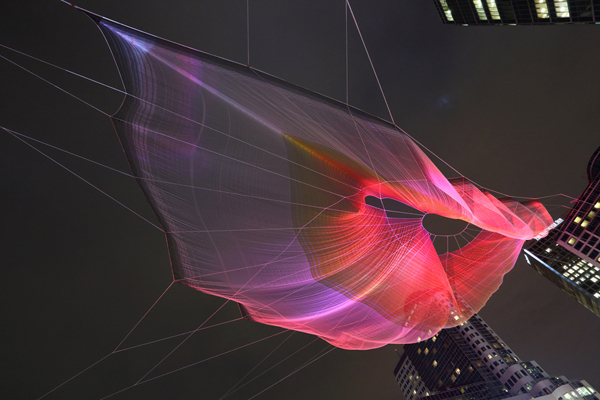 Skies Painted with Unnumbered Sparks, 2014, by Aaron Koblin and Janet Echelman.